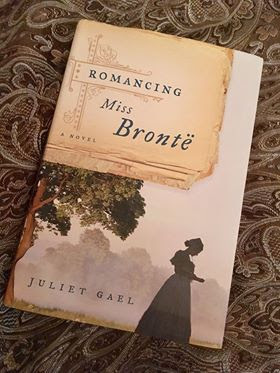 From Google Books: "In this brilliant mix of fact and fiction, Juliet Gael captures the passions, hopes, dreams, and sorrows of literature's most famous sisters--and imagines how love dramatically and most unexpectedly found Charlotte Brontë. During her two years Brussels, Charlotte had a taste of life's splendors; now, back home in the Yorkshire moors, duty-bound to a blind father and an alcoholic brother, an ambitious Charlotte refuses to sink into hopelessness. With her sisters, Emily and Anne, Charlotte conceives a plan to earn money and pursue a dream. Transforming her loneliness and personal sorrow into a triumph of literary art, Charlotte pens her 1847 masterpiece, Jane Eyre and catapults herself into the spotlight of London's fashionable literary scene--and into the arms of her new publisher, George Smith. But just as life begins to hold new promise, unspeakable tragedy descends on the Brontë household, throwing London and George into the background and leaving Charlotte to fear that the only romance she will ever find is at the tip of her pen. But another man waits in the Brontës' Haworth parsonage... Romancing Miss Brontë is a fascinating portrayal of an extraordinary woman whose life and work articulated our deepest human longing: to love and be loved in return." This was a story that will stick with me for a really long time and has claimed a high place on my list of best books ever. I was reluctant to read it as Charlotte was always my least favorite of the sisters, but this story brought her to life in a way that made me sympathetic to her. I can't say that I'm endeared to her, but I think I get her better now and don't hold as many grudges as I did before. At first, I wasn't sure about the writing style. Sometimes the story would go into deep detail; other times it would summarize more sterilely, like a nonfiction biography type. The author would zoom in to rich description and intimate dialogue, but then all the way out to the point of addressing the reader about the characters as if we were watching them together through a window. All that changes half way through or so and the author does address the issue in her afterward. She had a lot of ground to cover in bringing readers up to date with the Brontes past and lifestyle so her choice makes sense and was not badly done. I got lost in this sad story many times and found myself putting aside other important things to keep reading. The Brontes' story has always been one of the most tragic I've known. When I went to Haworth in 2016, I wept at the desolateness of the area and the sorrow that household had felt. However, being there and knowing the town and "neighborhood" featured in the story brought it to life dramatically. I was able to see it all in my mind's eye---so thankful for that. My husband and I have a northern England trip planned for 2020 or so. I hope to return to Haworth and see Charlotte's legacy there with a fresh perspective. Romancing Miss Bronte meets the requirements for The Victorian Reading Challenges at Belle's Library and at Becky's Book Reviews. Hello friends! How's your new year reading goal coming along? I'm on book two of my 70 book goal and am loving all the reading time this season of school break is giving me. I homeschool our eight youngest children and should probably plan our winter term---but we're all enjoying the break so much, and enjoying some good reads, that I find myself looking for excuses to extend it! I'm sharing a few neat finds that have been cluttering up my desk since this summer!! (True story!) First up is this cute little book from 1900, Rollo in London. Obviously I bought it for its cover---so pretty! The Rollo series began in the 1830s as a series of illustrations that needed a story put to them, so author Jacob Abbott took up the task. This book is part of Rollo's Tour in Europe, a series started in the 1850s, with this book being published in 1854. Another reason I bought it is because, while flipping through it in the shop, I found this cute Peter Rabbit cartoon inside. It's been there quite awhile as the page has discolored where it sat inside the book. The back of the cutting mentions some kind of shortage, as well as the following phrase: "Olive Oil is prescribed by many leading physicians as a tonic and tissue-builder." Looks like Rollo visited some pretty fab places---like Windsor Castle! Next up is a nod to my own dark humor. Do you get it? Sounds downright bone chilling to me! Jesus is precious to me. Jesus is precious to me." Makes me think of my Grammy Irma and all the sweet songs she wrote down in notebooks we found after she'd passed away. Finally is this awesome bookmark from 1886. I didn't actually find this---one of my BookCrossing friends sent it to me. Isn't it fabulous? The bookmark is an advertisement booklet for Harper's collection of magazines. "Now is a good time to subscribe," it says. On the back (front?) is this illustration, Coming from the Christmas-tree. "Christmas tree" being a relatively new American term and strangely hyphenated. The inside of the pamphlet lists all the books published by Harper's for that month, as well as a preview of the next month's books. Lots of well-known, now classic, stories in there! What kinds of neat things have you found in books lately? Hello readers! How's your first week of 2019 reading gone? I've just finished this year's first read, North by Northanger by Carrie Bebris---a fun continuation of Jane Austen's Pride and Prejudice. It was my second time through and I enjoyed it (and "got" it) much more this time around. From Amazon: "After the intrigues and excitements of their time in the city, the Darcys are more than prepared for a bit of peace and quiet at Pemberley. Finally, they can spend time together as Elizabeth settles into her pregnancy. However, serene solitude is not meant to be. First a letter from Lady Anne Fitzwilliam Darcy, long deceased, is discovered. The contents are both mysterious and prescient for Mrs. Darcy. Then a summons to Northanger Abbey involves the young couple in intrigues that threaten not just the Darcy legacy and good name, but Mr. Darcy's freedom as well. To make matters even worse and more uncomfortable for the expectant mother, Darcy's overbearing aunt, Lady Catherine de Bourgh, arrives on the scene to further bedevil Elizabeth. Add to this rumors of treasure and past scandals, and it becomes obvious that peacefulness is not at home in Pemberley, but secrets and spirits of the past are, and their revelations may have a most chilling effect on both the Darcys and their family to come." I'd forgotten how much I really love this author. I first read this book about 8 years ago and loved it then; but now, after visiting England a few times, reading through all the Austen novels, and learning a ton about their authoress, I found that I loved it all the more. I'll definitely be looking to find and reread the other Carrie Bebris Darcy mysteries. 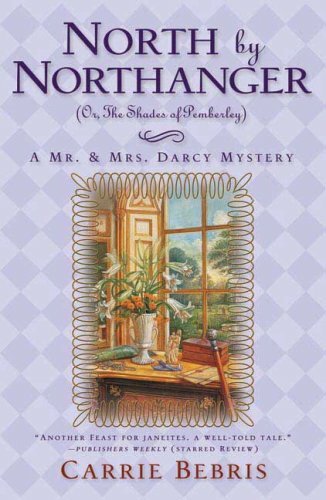 This was a fun mix of storylines as the Darcys traveled to Northanger Abbey and met the Tilneys, later finding that their lives are intertwined through the friendship of the two families' matriarchs. The story offered an interesting insight into what Elizabeth may have faced as new mistress of Pemberley---following in the footsteps of Darcy's mother. My favorite phrase from the story was, "invent cause for correspondence", which I found to be much more poetic than, "find a reason to write a letter." If I have any complaint about the story, it's that I don't think Lady Catherine and Lizzy would have been quite so horrible to one another. Once Lizzy was married and mistress of Pemberley, I believe the same spirit that caused Lady Catherine to be so cold to those "beneath" her would also force her to give more respect to the station Lizzy now occupies. With Lady Catherine, it's the standing of the person and not the person herself to which she responds. North by Northanger qualifies for the Georgian/Regency era reading challenge at Becky's Book Reviews.